To better understand sinusitis, let’s first discuss your sinuses. Within your skull you have four pairs of paranasal sinuses, these are air-filled spaces behind your nose, cheeks and forehead. Inside each sinus is a mucus layer and cells covered with cilia (little hairs) that trap and push out bacteria/pollutants that enter the nasal cavity. The length of suffering5 will help to categorize your sinusitis type (see chart below). Your provider may ask you questions about your symptoms and health history, and take a sample of your nasal discharge to see what kind of infection you might have. Your provider may want to do a computed tomography (CT) scan that creates images of the inside of your sinuses. 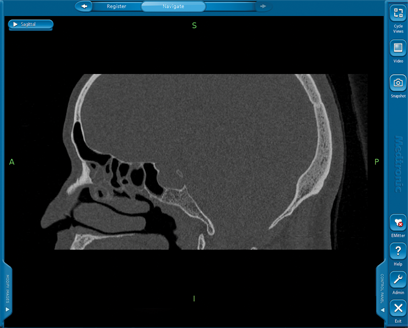 It may help them more accurately diagnose your condition and select the best treatment option for you.5 A CT scan is also used with our offices image guidance system (IGS) to help us navigate your sinuses during in-office procedures. Balloon sinus surgery has associated risks, including tissue trauma, bleeding, infection, and possible ophthalmic injury. Patients should always discuss their individual needs and the potential risks and benefits of any treatment or procedure with their doctor. This therapy is not for everyone. Please consult a healthcare professional. A prescription is required. For additional information, please visit Medtronic’s website at www.medtronicent.com. Rosenfeld RM, Andes D, Bhattacharyva N, et al. Clinical practice guidelines: Adult sinusitis. Otolaryngology Head Neck Surg. 2007;137:S1-S31. American Rhinologic Society. Sinus Anatomy. http://care.american-rhinologic.org/sinus-anatomy. Accessed September 16, 2015. American Rhinologic Society. Sinusitis Q&A. http://care.american-rhinologic.org/sinusitis_q_a? Accessed October 16, 2015.